Henry Murphy and Mary Lou Clark courted in this buggy before they were married on August 10, 1913. At the time this photograph was taken of Henry Murphy and his wife, Mary Lou (Clark) Murphy, he was 25 years-old and she was 18. The portrait was taken not long after the birth of their first daughter, Claudine. 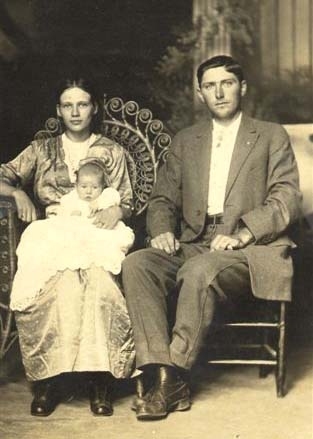 On August 10, 1913, a young man named Joseph Henry Murphy, who was originally from the Sulphur Creek Community near Peytonsburg, KY, a small community just across the state line from Celina, took as his bride, Mary Lou Clark, a young lady who grew up in the Mt. Pisgah Community, near Fellowship and Willow Grove in Clay County. Henry Murphy was a merchant by trade not long after he began his married life, and owned a store in the Lilly Dale community for a while. They then moved to Taylor’s Crossroads, where he also ran a store in that community. The business he ran in Taylor’s Crossroads, now owned by Ryan Meadows, and will be remembered by many as J.D. Coleman and Sons General Merchandise, is still in operation today. Henry and Mary Lou Murphy had five daughters, Claudine, Estelle, Lucille, Ruth, and Jo. The family lived in the house next door to the store in Taylor’s Crossroads, and then moved to a house not too far from the store, which is now occupied by Shirley (Melton) Garrett. Country stores were always places where old men gathered to trade. While there, they would tell tall tales, or just visit. It was at the store in Crossroads that Ruth learned many verses of the song “The Roadside Store” from listening to the older fellows who stopped by. But the family did not remain in the Taylor’s Crossroads Community too long. After giving up the business in the Crossroads, they moved by mule and wagon to Keeton Street in Livingston. There were nothing but dirt roads in or around the town of Livingston at that time, and that part of town was considered the country, with very few homes having been built there. Part of the property the Murphys owned included what is now Livingston City Park, and at that time it was just a pasture, as well as the area where Coleman Brothers Exxon is now. When the Murphys moved to Keeton Street, the road was what Estelle called a “loblolly”. Keeton Pond was just across from the Murphy home. And along with the five daughters, Henry’s parents lived in their home also. The Murphy girls worked just as hard as any family who had boys did. They raised a big garden, had a cow, and raised hogs and chickens, too. The girls would carry large wash tubs filled with water from Keeton Pond when it came time to set out sweet potato plants each year. Fertilizing cabbage plants with chicken manure was another chore the girls had to do. On certain occasions the other girls would get out of working in the garden, leaving Ruth and Estelle to continue on by themselves. When this happened, her sisters never got very far without being pelted with dirt clots from Ruth. Another job Ruth remembers was going across the field past Keeton Pond and up on the hillside to cut bean sticks from young sassafras trees. That was the place where the Murphy girls also went to pick wild strawberries that grew just as big as the tame ones we have today. They would bring home a big dishpan full that their mother would make into a delicious strawberry cobbler. Henry Murphy owned a Model T automobile, and would sometimes gather his family, including the grandparents, and head out to the Sulphur Creek Community to visit relatives. It was necessary to cross the Obey River to get to the home of the relatives, and if the river was up, sometimes the car would stall right in the middle of the river. 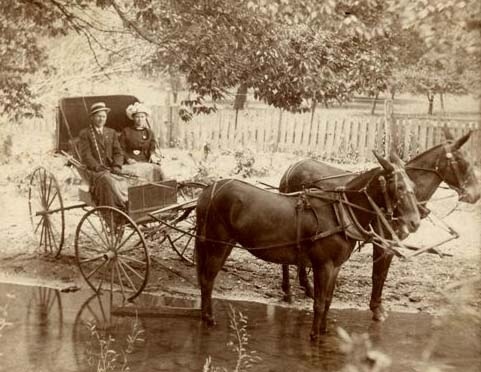 It was not unusual for someone who lived along the river bank to have to come to the rescue of the Murphy family, and bring a mule along to pull the car out of the river. The girls would be quite frightened when this happened and would have to get up in the seat because the water from the river would be running through the floorboard of the car. Picking up their feet was kind of hard to do since there would be a total of eight people squeezed into the car. On one occasion, the car refused to start after being pulled out of the river, and Henry and Mary, along with the oldest two daughters, had to push the car quite a distance, jumping in to ride when they came to a place where the road went downhill. 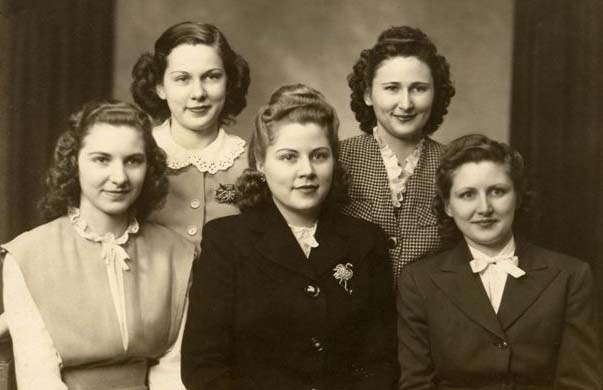 The Murphy girls are, front row from left, Lucille Townsend, Ruth Woodford, Estelle Hassler, back row, Jo Fulford and Claudine Ledbetter. After moving to Livingston, Henry ran a restaurant in a building behind Union Bank, which at that time was located on the corner of East Main and Church streets. Harrison Ledbetter, who later became Claudine’s father-in-law, did the cooking at this restaurant. He then operated another restaurant in a building that stood where John Officer’s law office is now situated. Mary made pies for her father’s restaurant business, and these would be carried in a basket by one of the daughters from their home to the restaurant to be served for dessert. This was another restaurant where my father helped with the cooking, and I’m told he loved to tease the Murphy girls anytime one of them stopped by. Estelle got him back one day for some of the teasing she had to put up with by putting a dead fly in the bottom of an ice cream cone she fixed for him. Henry’s career then changed from the restaurant business to a dry cleaning business. The first building where he operated a dry cleaner stood near the street on property where Union Bank & Trust Company is now. During the days Henry operated a dry cleaner, part of his business included driving to Twinton, Wilder, Crawford and Highland to pick up clothes that needed to be cleaned. He would bring them back to Livingston, and then drive back to each of those areas to return the cleaned items to his customers. This business was eventually sold to Willard Maynord, and another dry cleaning business was opened on Church Street called Modern Cleaners, which Henry operated for several years. In between having the two dry cleaning businesses, Henry and Mary Lou lived in Detroit, but returned to Tennessee after a short time and opened the second dry cleaner. The Clark home where Mary Murphy grew up in was described to me as a big farmhouse with a fireplace in the kitchen, the parlor, and in one of the bedrooms. This house was sometimes flooded when the Obey River would get out of its banks. The bedroom with the fireplace had a big double bed as well as one single bed. In the summertime, watermelons were cooled in the spring house near the Clark home, and were a delicious treat when the Murphy girls visited. Mary Lou Murphy would certainly be considered as a person who never had a lazy bone in her body. She remained quite active all her life, and even at the age of 95 years-old, she was still mowing her own yard. She was an exceptional seamstress and did alterations for many people around Livingston for a number of years. The extremely beautiful handwork she did, such as tatting, embroidery, and drawn work on pillowcases, is almost a lost art today. Weaving on large looms was taught to Mary Lou by her grandmother who used sheep’s wool and flax to make beautiful woven fabrics. Mary Lou always raised a very large garden as long as she was able. She was in her 60s when she learned to drive, and it was her son-in-law, Otto Ledbetter, who taught her. He would take her over to a field behind the Arnold Moore residence, and that was how she learned to drive. After she got her license, she would sometimes come by and pick Otto up and take him to his job at Nelm’s Market, which at that time was in the building on East Main Street that now houses a Chinese restaurant. While her daughters were growing up, Mary Lou made all their clothes. Much of the material used for their dresses came from Taylor and Holman, a business on the square in Livingston. The fabric could be bought for 25¢ a yard, and a dress could be made for around $1, including the spool of thread. Although the times were extremely hard when the Murphy girls were growing up, and they knew nothing but hard work, it didn’t take away from the fact that they were all considered beautiful girls. Estelle told me they didn’t have any trouble getting fellows who wanted to court them, and some fellows they didn’t care for at all were included in that number. The young men who won the hearts of the Murphy girls were: Claudine’s husband, Otto Ledbetter; Estelle’s husband, Harold H. Hassler; Lucille’s husband, Allen B. Townsend; Ruth’s husband, Elmer Woodford; and Jo’s husband, Clarence Jackson Fulford. Mary Lou and Henry have a total of 15 grandchildren who knew them as Ma-Ma Murphy and Papa Murphy. They also have 21 great grandchildren, and 6 great-great grandchildren. Lucille is the only one of the five girls who has passed away. Each daughter seems to have inherited her mother’s strength and stamina, but it must have been from their father that they each got their well-dressed and always extremely neat appearances, as I was told Henry always made sure he was well-groomed when he went anywhere. The homes of each of the Murphy girls I’ve been in are beautifully furnished, very tastefully decorated, and well cared for. The Murphy girls have all done well with their lives and have raised nice families. They share a lot of memories of their growing-up years when crossing the river in a car was nothing out of the ordinary, and the hard work they endured while growing up helped to build the strong, self-reliant and independent characteristics each one possesses today.